Other audio editions of Old Possum's Book of Practical Cats (some including a score) would come out later, but, for many Eliot enthusiasts, nothing else can quite match hearing the man himself introduce the likes of Rum Tum Tugger, Mr. Mistoffelees, and Bustopher Jones. Listeners in most geographies should be able to access the Spotify playlist. But if you live in Canada and South Africa (where some readers have reported problems) we can recommend that you listen (or re-listen) to Eliot's readings of his modernist masterpieces "The Waste Land" and "The Love Song of J. Alfred Prufrock", plus his Four Quartets. And if, by chance, you feel like hearing Eliot's verse but not Eliot's voice, how about letting Bob Dylan take over reading duties? 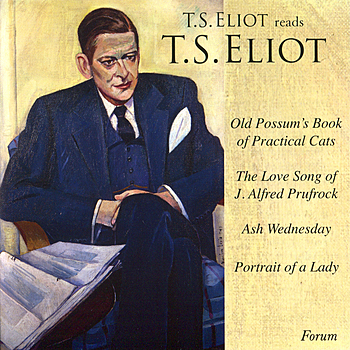 Eliot's reading of Old Possum's Book of Practical Cats will be added to our collection, 1,000 Free Audio Books: Download Great Books for Free. would you please tell me how can I download these amazing audio versions by the voice of this marvelous poet himself…? It is really a pity this is on spotify. Why not post it as files or put it on soundcloud or something which doesn’t require subscription and special software download..
it is hardly “open culture” when you need to sign up for a company, is it?